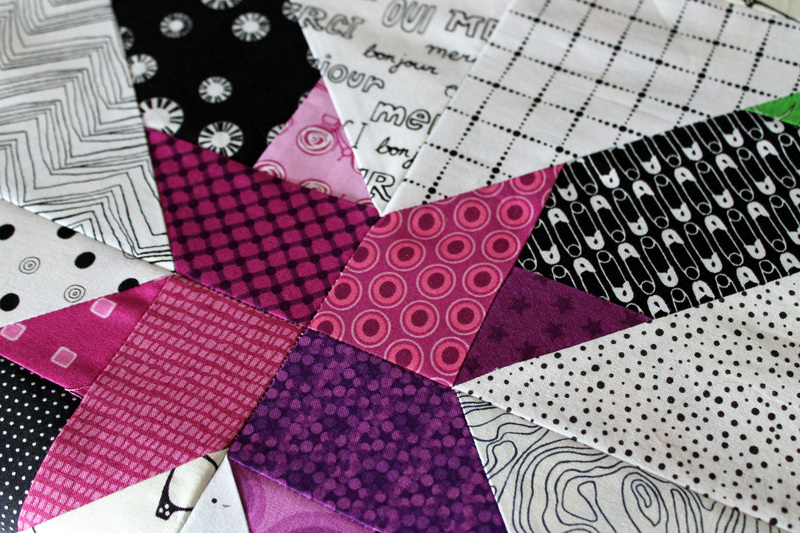 I must admit my strong feelings about this quilt maybe effected slightly because I designed the quilt block. You can find the free paper piecing pattern and details about my inspirations here on the original post. I had a lot of fun making this quilt slowly, piece by piece. Using colour pencils and paper I worked out each square in advance. The central stars are made from lots of little bits from my scrap pile. The black and white fabrics were a little bit of scrap pile and a lot of stash cutting. I wanted bright colours for the stars and mainly worked with red, yellow, orange, blue, green and purple with a smattering of apricot, fuchsia and citron. 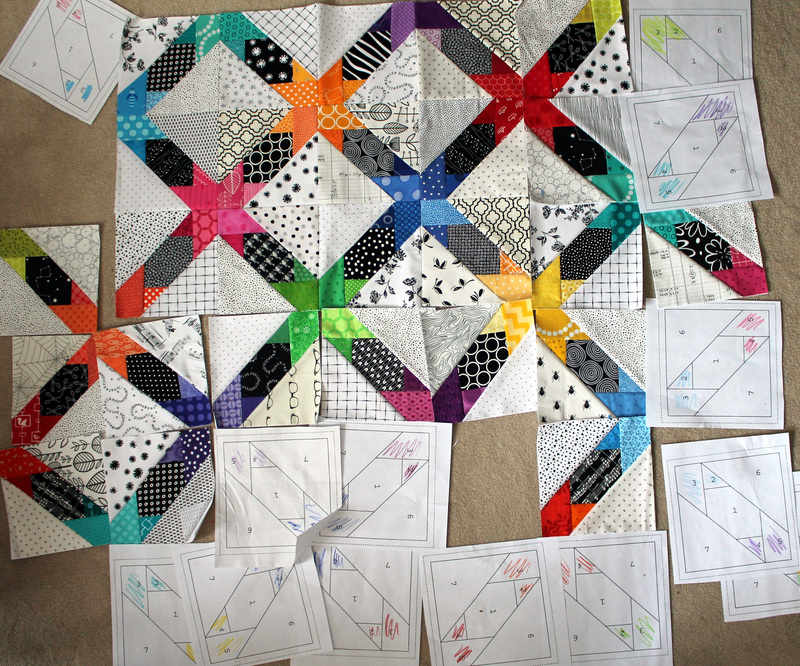 The finished quilt top is 62 inches square – five blocks across five blocks down. This of course meant there was a lot of paper to pull off the back. 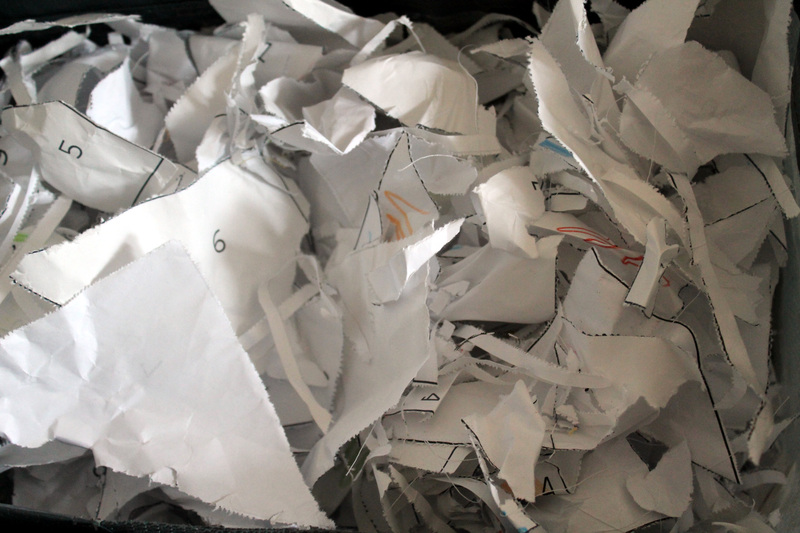 I am now off to vacuum up the paper and thread pieces that are littered all over our living room floor, before my husband comes home! That is fabulous! What a great way to use scraps. Wow wow wow wow wow wow wow. To funny. I am taking that as good wows. gorgeous and colorful! love it so much. I really love the black and white!! I need to get my hands on more of it, seems like my stash is completely full of color at the moment. Beautiful quilt top, can’t wait to see it finished. Wow. There are no words. This is my all time favorite of yours!!!! Totally gorgeous! The icing on the cake is that you used up a bunch of scraps too! I couldn’t not stop in my tracks to say how uber impressed I am with you, your design, fabric selection, and assembly. This is out of the park! Sparkle on! This quilt is so fantastic! The colors and layout! I can’t wait to see how you’re going to quilt it. Gorgeous! I love that you could use LITTLE scraps so well. Just fantastic!! I cant’ get any words out… i keep scrolling up to look again and again!! I will absolutely need to try this! Gorgeous! Thank you so much. I am so glad other people like my idea. I’m like drooling over here! Absolutely stunning!!! I think this one may be on my bucket list now! 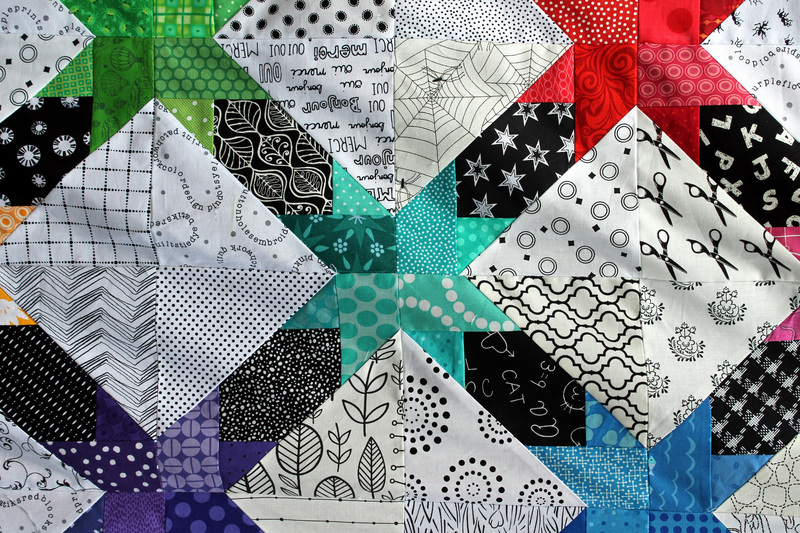 Love your quilt and all your fabulous black and white prints! It turned out wonderfully! This quilt is a show stopper! I love the brights against the low volume background and the pattern is just fantastic!! 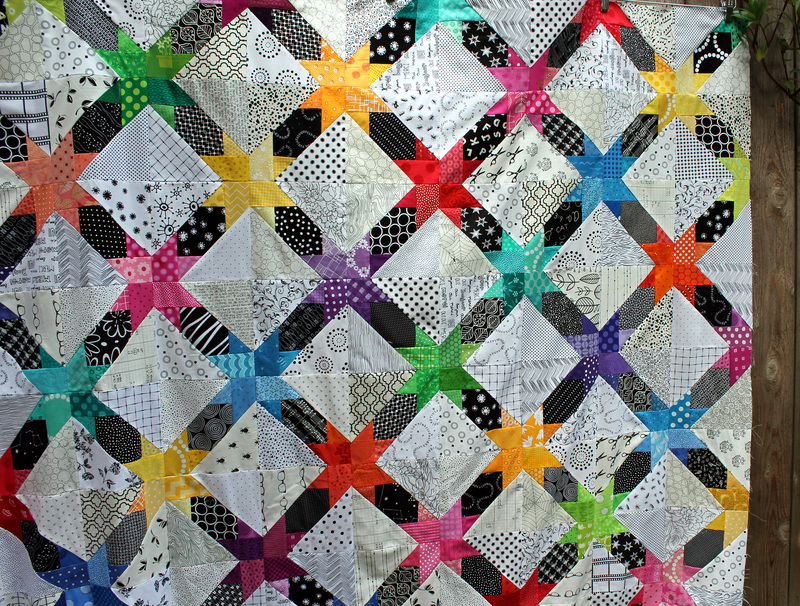 Cath ……I love love love this quilt……..amazing. You really are a Star!! no pun intended. I just love the way the colour pops with the black and white backgrounds. Thanks for the inspiration!! WOW and WOW again! What an incredible quilt top! I am off to get your pattern – tank you for linking up to TGIFF!!! Beautiful!! I love your design and the pops of color with the black and white! Absolutely stunningly PERFECT! Love, love, love it! Hope you don’t mind if I share it with a link back on my facebook page at http://facebook.com/sewfreshquilts. It’s just too beautiful not to share! Not a problem at all. I love this pattern and can not wait to see what other people do with it. This is just gorgeous and fun! Thanks for sharing your pattern with us. This came out so so great!! I love those scrappy stars. Having also just finished a paper pieced top, I can also appreciate the huge amount of work in removing all that paper. Congrats on such a wonderful finish! Your wonderful pillow started all this. I love the pattern you created and had to find a way to make it as a quilt. Wow! What a great pattern. Love the fabrics. Now that I’ve studied this pattern, I’ve decided to give it a try, if you don’t mind. You’ll find it on my blog in some days. I can not wait to see what you do with the pattern. Please let me know when you have photos up. Your quilt is brilliant. Incredible choice of fabrics that make the final result really really outstanding! 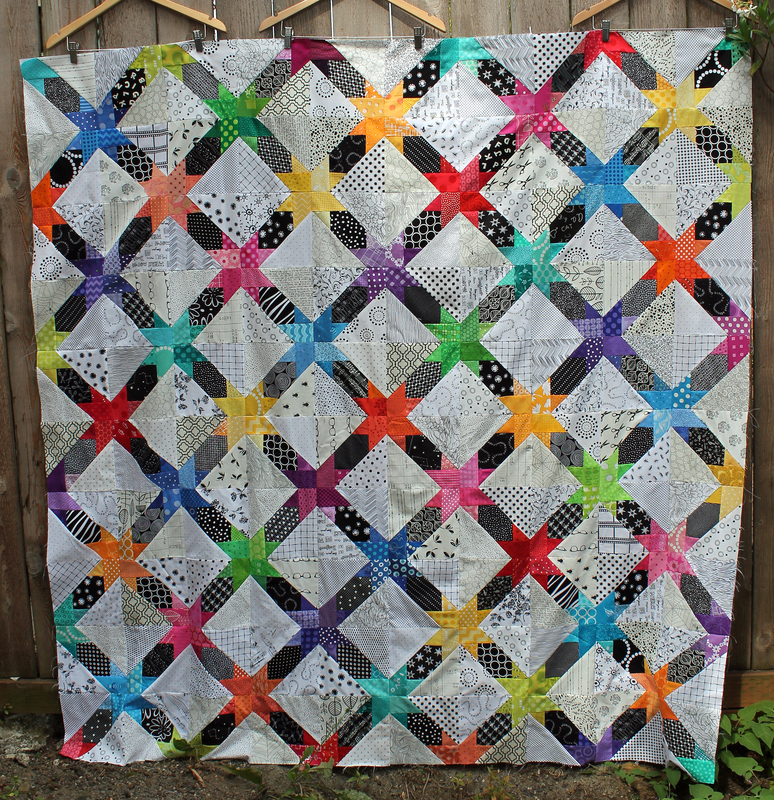 LOVE a rainbow quilt, and LOVE a rainbow + low volume quilt! Incredible, Cath. I can’t wait to see it all quilted up! Congratulations on such a wonderful design. Excellent choice of colours, too. It looks great. So gorgeous, the colours look fantastic against the black and white! Beautiful quilt! I love the colors and the star patter is gorgeous! This is so ah-maz-balls! Great finish! LOVE it! Pure gorgeousness (is that a word?). I am sure it is a word because I se it all the time! Thanks for the kind words. Absolutely beautiful – already commented on Flickr, but had to read the post. I love scrappy quilts. Thanks for the kind comments Julie. I am really proud of this quilt so far. I am now ummming and ahhhing about backing and quilting. Love this! What a great collection of scraps you have here, too–all the colors, plus the blacks and the lights. Beautiful! Gorgeous! Love the color array and use of the black and white. Thanks Dorothy. I do love me some scraps, as you know.